Two teams of two adults competed. In the first two rounds, each team took part in a stunt that involved pricing items, Hollywood celebrities, or just generally being silly. In each round, one team is shown the first stunt, and then has a choice of either playing that stunt or passing it to the other team and playing the second stunt in the round. 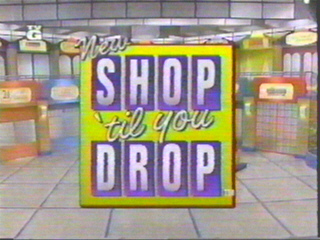 Completing a stunt successfully earns the team 100 points in round 1, or 200 points in round 2, plus the opportunity to win a prize by selecting one of the stores in the makeshift "mall" on the set. The third round was called the "Shopper's Challenge" round, which was a 90-second speed round of questions. Team members alternated the resposibility of answering each question. Right answers were worth 50 points. The team with the highest score at the end of the round won the game and went on to the bonus round. If there was a tie, one sudden-death question was asked. The team now has 90 seconds to shop for gifts. One member of the team opened boxes at a table, while the other player ran the packages around the mall. If the team decided to keep the gift that was opened, the runner took it to a table on the opposite side of the set and hit a button at center stage, prompting the shopper to open another box. If the prize was rejected, the runner took the box to one of the stores in the mall, exchanged with the box there, and brought that to the table. After all six boxes were kept or exchanged, or after time ran out, the value of the prizes were added up. If the team could amass more than $2500 in prizes, they also won a vacation. Stone-Stanley is the whipping boy in the game show fandom. Ask any fan of the genre about this production company, and you'll often be met with a cringe. This show is one of those reasons: it's not a terribly original concept, with Beat the Clock and The Price is Right having beaten it to the punch; it's hosted by a man who appears to have 46 teeth; and the prizes are kinda chinsy (things like chafing dishes and Jules Jurgensen watches). Still, I have to give them credit. I mean, this show has been around for much of the '90s, so it has some staying power, even if the game itself is a little goofy.